Edinburgh Gardens is a hugely popular park located in Fitzroy North and is a favourite spot for locals to enjoy a picnic or BBQ on the weekend. Established in 1862, the beautiful gardens have been well maintained and improved over the years with a bowling club, tennis courts, rotunda and oval now included in the parklands. There are large expanses of lawn areas at Edinburgh Gardens which are perfect for picnics, frisbee and ball games. There are a number of interconnecting pathways located all over the park which also makes this area a great place to go for a bike ride, run or stroll. 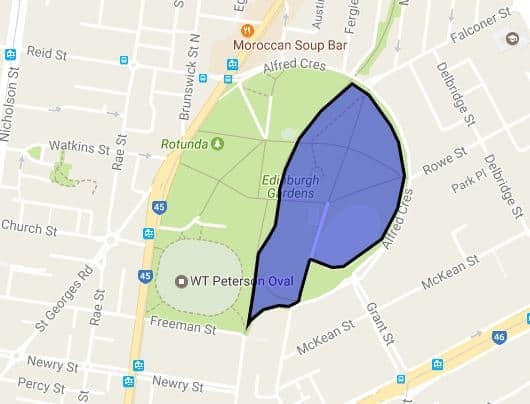 Dogs are welcome in the park and there is a large off leash area on the eastern side of the park (see the purple areas in the image below). Other facilities include toilets, a skate park, basketball half court and drinking fountains. There are two playgrounds located in the park which include slides, a climbing spider net, bridges, monkey bars, and swings. There are also BBQs and picnic tables located near the rotunda and near the new playground. Picnic tables are used on a first come first served basis. If you wish to hire the rotunda, you can request a booking here. A minimum of 10 days notice is required and a security deposit fee is payable. Although alcohol is generally prohibited in public spaces in Victoria, the ban does not apply in prescribed local parks and gardens such as Edinburgh Gardens. This means that you are permitted drink alcohol in the park between the hours of 9am-9pm. The best part about Edinburgh Gardens is its proximity to Brunswick Street where you can stop off to buy any items that you forgot, as well as drinks and snacks. UberEats and Deliveroo also deliver to the park! Edinburgh Gardens is easily accessible by public transport, with Brunswick Street bordering the west side of the park. Catch a route #11 tram up Brunswick Street and alight at the Fitzroy Bowls Club.